75 ball bingo - Rules & How to Play at Loony Bingo! 75 ball bingo is one of the most popular bingo variations to play online. Also known as American bingo, these games offer loads of opportunities to win big at Loony Bingo! 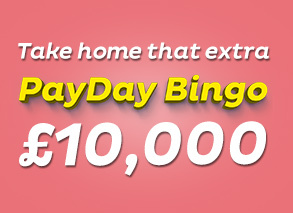 Play in Self-Made Millionaire every month for your chance at the £1,000,000 prize pot! How could you resist?! The rules and instructions to the game are quite simple and easy to get the hang of! Go ahead and purchase your cards in any of the 75-ball bingo rooms in the lobby. The bingo cards have 25 numbers on a 5x5 grid ranging from 1 to 75. The caller will call out a number at random and if it appears on your card, you need to daub it (or use auto-daub). Keep in mind the winning bingo pattern which you can see on the top right of the screen. The first player to complete the pattern wins! To learn more check out our bingo rules wiki page. To win the bingo games players can bingo by filling in entire horizontal, vertical or diagonal lines, or special patterns. 75 ball bingo games can be really fun when the designated pattern is unique or festive!